We’ve made these little shortbread cookies lots of times, usually with the food processor, which means the cookies are ready for the oven in less than 5 minutes. My dough comes out very very dry and sandy, so you can’t roll it in your palms, but it holds together when squeezed (but you can add a tablespoon or two of water if your dough truly won’t cooperate). I am just extra gentle when pressing the cookies flat with a fork. 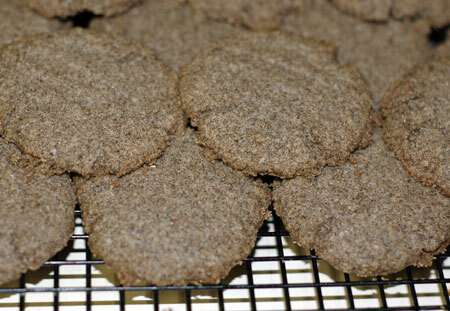 That minor aggravation is worth it for the delicate flavor and texture of these cookies. They seem sweeter than the amount of sugar should justify, with a lovely undertone of caramel, and of course, they have a fascinating dusky color from the buckwheat, to which they were my first introduction. When I made these with my parents, we tried them dipped in some warm melting chocolate, and the combination was really lovely. I keep meaning to bring a batch to work and call them sand cookies to see if people can guess the secret ingredient. Heat oven to 325F. Put dry ingredients in bowl of food processor, and pulse once or twice to mix. Add butter, and pulse about 15 times, until pea-size pieces form. Add egg, and pulse 8 times, or until dough just comes together. Alternatively, combine dry ingredients in a bowl, and stir with a whisk to mix; in a mixing bowl, beat butter until fluffy, and add eggs; beat in the dry ingredients in 2 batches, scraping down sides of bowl between additions. The dough may be very crumbly, but it should hold together when pinched. Form tablespoons of dough into balls by tightly pressing together with your hands, and place 1 1/2″ apart on baking sheets; use a fork to press dough into rounds 3/8″ thick. Bake 15 to 20 minutes, until golden around edges. Cool on a wire rack. Update 11/10/07: I made a half-batch tonight to use up an extra egg yolk, and tried a new shaping technique. I used my cookie scoop and firmly pressed some of the wet-sandy dough into it with my thumb. Then I released the scoop into my hand, and set the resulting dome of dough onto the cookie sheet. From there I could fork-flatten as usual. I really can’t stop eating these things once I start! Update 2/28/2008: I had two extra egg yolks and an hour before we had to leave for a meeting with our doula after work, so I immediately turned on the oven and popped ingredients in the Cuisinart when I got home, and less than 20 minutes later there were cookies baking. Managed to squeeze them all into two batches, and pulled the second sheet from the oven just moments before walking out the door. So these are a good last-minute dessert if you need something fast. Also, still can’t stop eating them!